Babblings of a Mommy: The Easiest DIY Tablescape EVER. The Easiest DIY Tablescape EVER. My brother is getting married soon and I've been given flower duty, so I've been on the lookout for nice floral arrangements and tablescapes. Today I came across this pic that made me stop in my tracks. It's not really appropriate for his wedding, but it would be perfect for a casual spring setting! How cute does this look and it would literally take 2 seconds to whip together!! 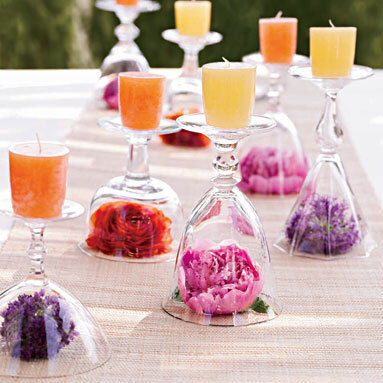 All you need is a couple of wine glasses, a few cut color flowers, and a handful of candles--that's it! Super easy and not-to-mention extremely affordable since most of the items you probably already have! Just spend a few bucks on some stems and you're good-to-go.